Fathom provides management reporting and analysis on a monthly, quarterly, and annual basis. Fathom also enables month-to-date, quarter-to-date, and year-to-date analysis and reporting. Monthly periods are based on a standard calendar month. However, quarterly and annual reporting periods are based on the financial year of the company in Fathom. The starting month of your company’s financial year in Fathom is determined by the financial year defined in your source accounting system, or in cell B2 of your Excel import sheet. You can manually update Fathom to the current (incomplete) monthly period to bring in month-to-date (MTD) results. 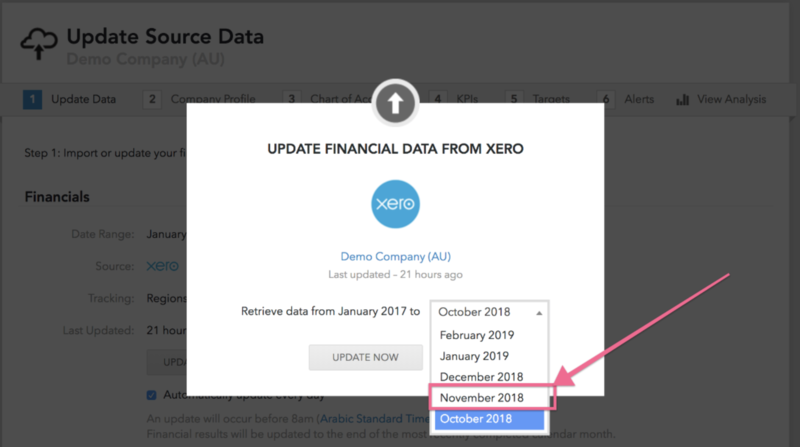 To do so, proceed to 'Step 1 - Update data' and click on 'Update from Xero/QBO/MYOB'. You will be able to select the current (incomplete) month. This may be hard to find - it is located above the previous month in the dropdown list. Once you have updated Fathom to MTD results, tick the checkbox to allow Fathom to automatically draw in data for the rest of the month on a daily basis. Quarterly periods in Fathom will be based on the financial year of your company. For example, if your financial year begins in January, Q1 will encompass January - March results. Quarter-to-Date (QTD) reporting is available for incomplete quarters. The results displayed for a QTD period will begin in the first month of the quarter, and will run through the most recently updated month, or month-to-date period in Fathom. Fathom’s annual period will begin in the first month of your company’s financial year. For YTD reporting, the results will include data from the first month of your financial year, through the most recently imported/updated period in Fathom. The financial year for a company is defined by the accounting system it is derived from. ie. Xero, QBO, Excel. You cannot change the fiscal year in Fathom and if the fiscal year changes in the source accounting system, you will need to delete and re-import the company into Fathom. Note that you can set the fiscal year when you import from Excel, so if you need to report on a different fiscal year you could import the financial data through excel. You can import up to eight years of monthly data into Fathom. Once you have eight years you will need to periodically remove earlier periods before you add more recent data. You can perform this removal in the company setup under 'Step 1: Update Data > Remove Periods'. When utilising the “before and including” option, it is important to note that you are deleting historical periods that will effectively change the starting date of your company data in Fathom. Once the starting date of your data has been altered by removing historical periods, these periods cannot be re-added, except by deleting and re-importing the company to Fathom. While it is possible to load future financial periods, Fathom recommends only loading financials up until the current period. While you can choose the YTD in any of the tools or reports, Fathom uses the most recent financial period to set the default view and it can be annoying to be always changing back to the current period. Future financial data should be loaded as a budget or target. Does Fathom support weekly reporting or custom reporting periods? Fathom does not currently provide weekly reporting or custom reporting periods (eg 4-4-5 or 13 months).